Active racer since 1992 experienced in road, cyclocross (cat. 1), mtb and TT. Chris has coached and/or worked as a mechanic at several training camps and cyclo-cross clinics. Available for camps as a coach and/or mechanic. Mentor to younger riders for years. Beta tester for advances in power based training, including the performance manager impulse-response model. Two interviews with Chris, one from 2009, one from 2010. "Since my first race, where he was volunteering his time for new racers, Chris Mayhew has been full of unparalleled advice and guidance. Chris advised me on all aspects of the sport, seeing me transition from a category 5 to a category 1. Along with providing training and technical advice for road racing, Chris recommended courses and races that suited my abilities. Chris' urging and enthusiasm also encouraged me to start racing cyclocross. Again, his knowledge of and experience with Mid Atlantic racing was the key to a steep learning curve. Chris' expertise came true to form as I stumbled through my first season with a power meter, he was always available for technical assistance and trouble shooting advice. Without his advice and guidance, I feel my relative success as a cyclist would have been less." Cat 1 road/cross, Pro MTB. himself available for the occasional question and provided useful feedback. I was nervous there weren't more long endurance rides baked into the plan, but I stuck with it almost to the letter. Initially I would ask Chris "is this all? I'm having to hold myself back" and he would encourage me to look long term and allow myself to be fully recovered. He was right: ten weeks into the block the work did get tougher, and I was able to push through. Long story short, I achieved my goal of getting on the Cat 3 podium of the Green Mountain Stage Race. After a problematic TT where I left too much in the tank, I got in a 3 person breakaway on the long App Gap stage. We stuck it to the finish, I got 2nd on the day, and gained enough time to land in 3rd overall. For the final crit, I still had enough snap to ride upfront and protect my placing. I wouldn't hesitate to recommend Chris' coaching and consultation services. If the one-off consultation is any indication, I can only imagine that full-time coaching would bring great results." "3 years ago I started my first cyclocross race and for the last two seasons I've been riding and training with Chris. This season I brought home my first victory along with a Top 10 finish in each of the 5 UCI ranked events I started. Chris has been a tremendous aid and has helped me progress beyond what I would have been capable of on my own." "I wanted to let you know that this season was my best by far. Not only did I get my first podiums, I had numerous podium finishes and had enough fitness to keep training and racing for the full season! Thanks Chris! I was also going to mention that you helped me get my threshold up 50plus watts from where it was." concerning racing tactics and bike and equipment maintenance." "I have been working with Chris since January of 2007. I have found that he provides me with outstanding plans, and great feedback. He has been quick to respond to my questions, and before my big events he has given me great tips, as well as any course or local knowledge he may have that could help me perform better. This fall, for the first time in 10 years of racing cyclocross, I won a Cat 3 race. This is in no small part a product of Chris' efforts and guidance. Chris has been a vital partner in both my and my wife's preparation for the 2007 Cross Season. "Chris Mayhew has been involved with cycling and racing for as long as I have known him and if I ever have a question about cycling, if it be of fitness, strategy, or skills; Chris always has an answer backed up by his experience. 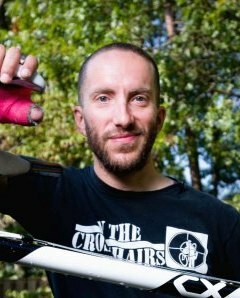 I respect his opinions and advice from setting the bicycle up mechanically, practicing for the discipline of cyclocross, and strategies for criterium racing." "Chris has been a great mentor. From his work at our local races, to helping out younger and newer cyclists, Chris has really shined in strengthening those with whom he has worked." tirelessly to make sure that the girls' bikes were in perfect condition, and was always there to lend a hand with other duties for the team. His commitment and dedication to his work was outstanding. Plus, he was fun to have around!"